A couple of years later, you must have gotten quite a kick out of hearing what Frank wound up doing with the transitions between songs, as they gradually appeared on Sheik Yerbouti, Shut Up 'n Play Yer Guitar, etc.! In case this is the slightest bit interesting, I once compared two officially released versions of "The Adventures of Greggery Peccary" -- the one on the Barking Pumpkin cassette of Studio Tan, and the one on the triple-disc Läther set issued in '96. The Läther version contains occasionally opposite stereo from the Studio Tan version, as well as an extra two measures of animate flutes (at 3:28) and a chaotic horn section with mean-sounding piano trills (at 14:42). The very end of the Studio Tan rendition finishes with a foreseeable percussion note, instead of cutting to a guitar slide as on Läther. 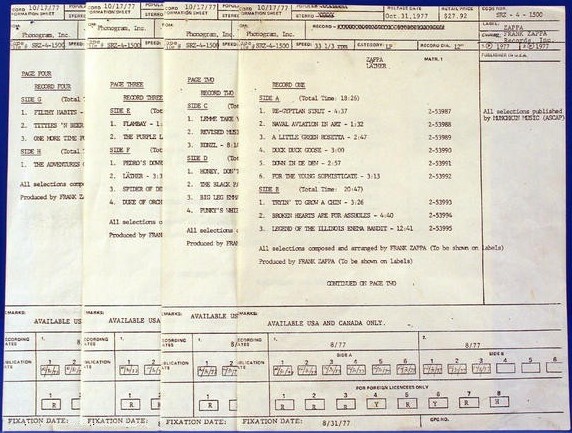 October 31, 1977. The retail price of this was going to be $27.92 US dollars. It's this release I have the tapes for. Last edited by MOOP on Sat Feb 17, 2018 8:42 am, edited 1 time in total. Biffy just didn't know the difference between a multitrack master tape and a mixed-down, two-channel master tape. That was me. The argument I was making at the time was specifically about that difference. People had the impression from the way it was reported in the press that the tape damage in question was the bass and drum tracks on the multitracks being unusable, so FZ had to re-record those parts. I was pointing out that it was the edited stereo master of WOIIFTM that was deteriorated, necessitating a remix from the (intact) multis. And as long as he was remixing anyway, he took the opportunity to have Arthur and Chad replace Roy's and JCB's parts. The main point being that he did that not for technical reasons, but because he wanted to. Ah, I see. I remember being slightly pissed when I read your statement "Frank lied" back in the late '90s (I think), as I was still at that age when any musical artists you like have halos over their heads. I was thinking, "Well, in the 1/90 issue of Goldmine, he said it was a creative decision he made, as long as the two-track masters had to be re-assembled anyway!" But then, I'm one of the very few Zappanatics who prefer the remastered Ruben to the original. I've sure been torn to pieces by other fans for that one! By the way, thank you for your services to all other Zappa fans over the years, Biffy! Yours was the first Zappa-related website I encountered when I first got online, and I read it fanatically, thinking, "This is so cool! Someone's writing about Zappa on the Internet!" You were certainly one of the very first. +1 Yes absolutely. However, I always thought Biffy was a girl. Just my thoughts: The Sounds interview was in January 1977. At that point he knew that he was going to complete 4 albums for WB right after the tour. To my understanding he was talking about 4 separate albums he had already in the works (I could be wrong of course). None of those albums contain material from that European tour. Läther does. So I have a slight tendency to think the 4 albums came first and Läther later. Since I don't know for sure I will stay with that theory until somebody proves different. These are all great theories. I'm finding this thread fascinating. I didn't know about the 1/77 Sounds interview before, for instance, and that definitely indicates that Frank was planning four different albums at that time. Were they the albums that would eventually become the Läther-ettes, though? The fun thing about discussions like this is that Frank was always reworking album ideas before settling on official releases. For instance, what would be split into Zoot Allures and most of Sleep Dirt was originally a double album called Night of the Iron Sausage. That's just one example, obviously. Unless I'm mistaken, only Joe Travers would truly be able to find some kind of solid evidence, in terms of tape dates! An interesting twist (or maybe an uninteresting trivium...I'm something of a pedant) is that considering any of Frank's own Läther sequences, including Slime's images above, it seems that Warner Bros. / Gary Panter got a few titles wrong on the three albums that followed Zappa in New York. It betrays sloppiness on Warner's part, or perhaps sheer apathy. Another possibility is that Frank himself spelled them differently when submitting the separate LPs, as opposed to the titles he handed over with Läther. Here are the only ones I can think of offhand. Did I miss any? "RDNZL" was misspelled as "Redunzel"
The hyphen was left out of "Re-Gyptian Strut"
"The Adventures of Greggery Peccary" was mistitled as simply "Greggery Peccary"
In the other german interview (Musik Express may 1979), that i tried to post here earlier, Zappa complains about the lousy quality of the releases in general: No information about the musicians or the composer etc., and the artwork of course. He even calls the albums bootlegs, cause Warner didn't have the rights to release them. He also complaines about Warner changing things against his will. I guess he basically speaks about the exclusion of Punkies whips in this term. But he also speaks about major changes in the case of sleep dirt like the order of the songs and that its original title should have been hot rats 3. In the end of the interview he reveals himself as the voice of Greggary. Zappa hat manchmal ’ne Menge Mist erzählt. Insbesondere hat er im Fall von Studio Tan, Sleep Dirt und Orchestral Favorites seine eigenen Produkte schlecht gemacht. Auch was die Soundqualität betrifft, was ganz und gar nicht den Tatsachen entspricht. Einzig und allein wegen seines (Klein-)Krieges mit Warner Brothers. Ich bin froh, dass es die separaten Alben in dieser erstklassigen Qualität gibt. Of course you cannot trust every word he says. Obviously he wanted Warner to look really bad. ewh! No actually thinking "The Taming of the Shrew" ie: Katherina, the headstrong, obdurate shrew. Thing Fish or Franscesco Zappa ? I notice that Wikipedia has an incorrect release date for Thing-Fish: listed as December 21, but the LP was definitely in stores in November, released simultaneously with Francesco. This question has always intrigued me. What I've found is that Zappa In New York, Studio Tan, Hot Rats 3 (Sleep Dirt), and Zappa Orchestral Favorites (Orchestral Favorites) all existed as individual albums before they were resequenced into Lather. Scott Parker’s book “The Zappa Supplement: A Box Of History And The Mud Shark Saga” delves into and devotes 22 pages to the chronology of the Lather saga. Inescapable conclusion (based on rigorous documentation, including numerous interviews by Zappa himself): the four separate albums came first. 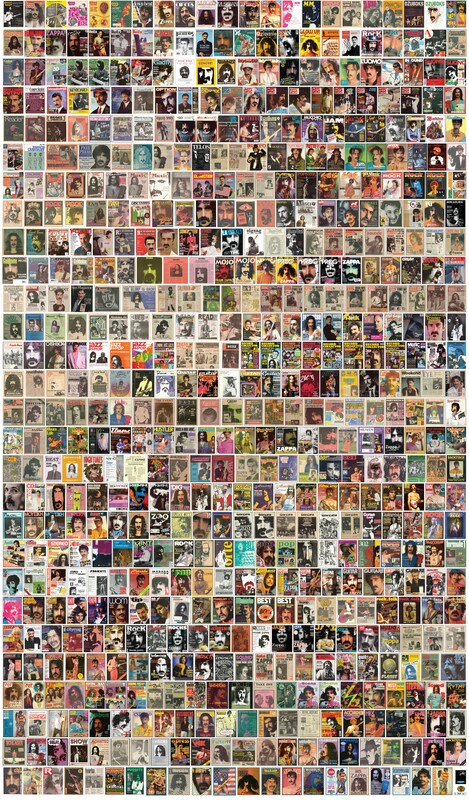 If I find it, I’ll post it—there was an interesting interview with Zappa (arent’ they all?) published in the Sept 1976 Crawdaddy mag that sheds some light on the original Zoot Allures and Orchestra albums. As the pieces on Orchestral Favorites were recorded in Royce Hall in late '75, I guess the original intention to release it in early '76 makes more sense than Frank waiting a couple of years, given how highly he always prioritized his orchestral material. Then again, he held onto the amazing Studio Tan, etc. recordings for quite a while -- since '74, in some cases -- so who knows? I'm sure looking forward to reading Scott's book. Thanks! Hi welcome, it would be great if you shared this here. Per Crawdaddy Magazine, Zappa was attending the Billboard Talent Forum at the Beverly Hilton in Los Angeles, (held first week of June 1976, per Billboard Magazine’s front-page story, dated June 5, 1976, that specifically mentions Zappa’a presence.) Zappa was there trying to get backing to air his 1975 video A Token of His Extreme, and “also brought to the convention mixes from his two forthcoming albums and the one he had produced for Grand Funk Railroad, Good Singin’, Good Playin’” (released August ’76). Listening to Zoot, Crawdaddy states, “…Beatlesque reversed tapes. ‘That’s reversed lead guitar,’ observed Frank… ‘I played the guitar backward, behind my head. That’s how I get my sound.’” This description can only be of “Filthy Habits,” which was part of the Zoot double album track list. 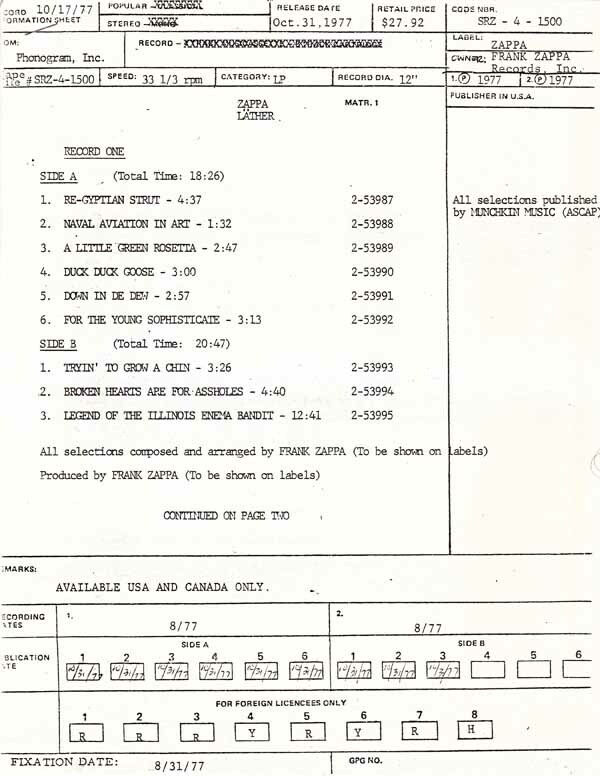 Based on this, it’s safe to assume the albums Zappa brought with him that June were the double Zoot Allures and the Six Things, now retitled Six Pieces for Orchestra. Then, between that June and October, something clearly went south between Zappa, Cohen, Discreet, and Warners. Zoot was pared down to one album and released on Warners’ main label. 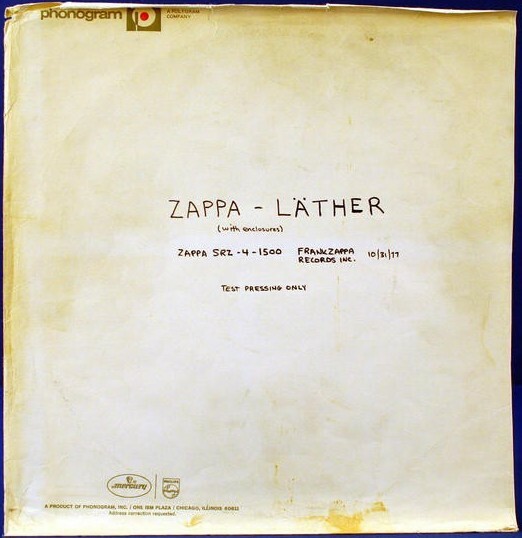 Zappa lost access to Zoot’s master tapes and dubbed the album using a 15 ips safety copy. Six Pieces for Orchestra disappeared (for the time being). Had all gone as planned in 1976, the only remaining album of the four yet to be released was Studio Tan (Zappa in NY had not been recorded yet), so my guess is that ST was anticipated for release in ’77.